Accessible sources of clinical information have proliferated over the past decade. These new sources contextualizing information for practice are user-friendly, although because much is not peer reviewed there are questions their accuracy. On the other hand, traditional peer-reviewed material can be somewhat removed from the needs of practicing dentists, and recently questions have been raised about the accuracy of journals as well. This study assessed the accuracy of cone beam computed tomography (CBCT) radiation safety information in both professional media and peer-reviewed journals. Articles introducing CBCT technology to dentists and published in peer-reviewed journals were compared to articles appearing in professional magazines, clinically oriented news sites, and blogs written by clinicians for clinicians. Reported radiation dose of CBCT and conventional dental radiographs were recorded as well as conclusions about the comparative dose of the two imaging modalities. The proportion of articles reporting CBCT dose to be greater than, equal to or less than conventional dental radiographs was not different between peer-reviewed and professional media during this period. 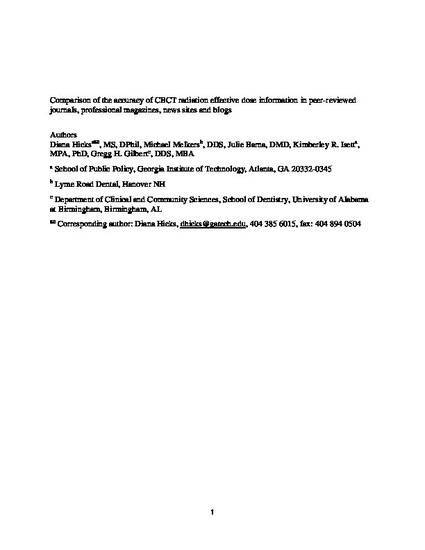 There is weak evidence that the conclusions of peer-reviewed journal articles (but not professional media) became more conservative after the publication of a New York Times article critical of misinformation about the safety and efficacy of CBCT in dentistry. Non-peer-reviewed professional media were as accurate as peer-reviewed journals for this topic and during the time period assessed, which is somewhat surprising. However, the method used here necessitated a very narrow focus and certainly more studies are needed to broaden understanding.